Day 3 in Paris was an absolute beautiful day! It started early with Blue Skies. 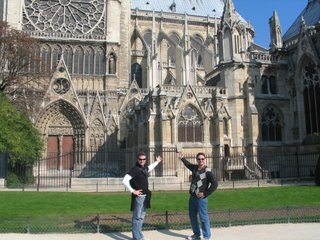 We decided we would get out early and try to make the most of our Paris Museum pass we had purchased on the first day. 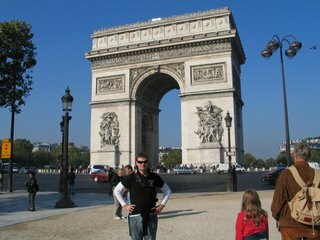 First stop of the day was the Arch of Triumph. As normal we took the Metro to the closest stop. When we arrived we weren’t disappointed. 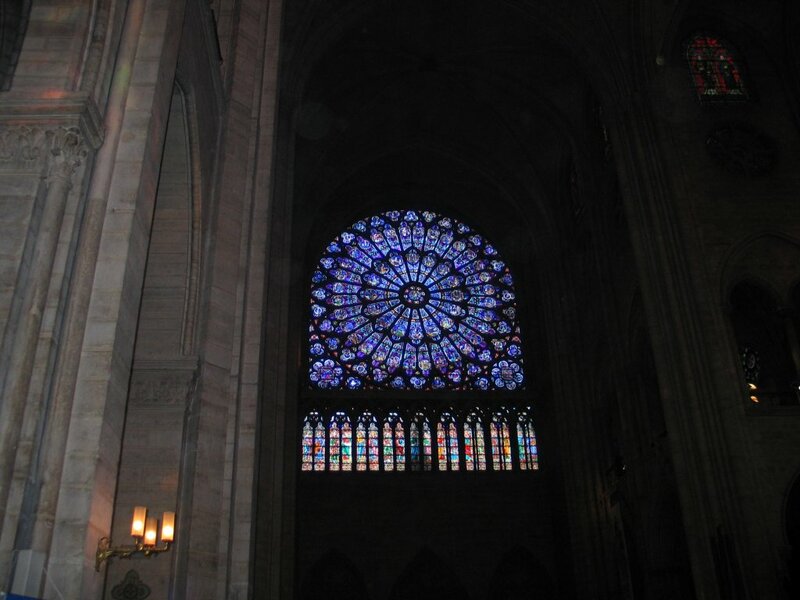 This Arch is massive, and is a very very impressive structure. 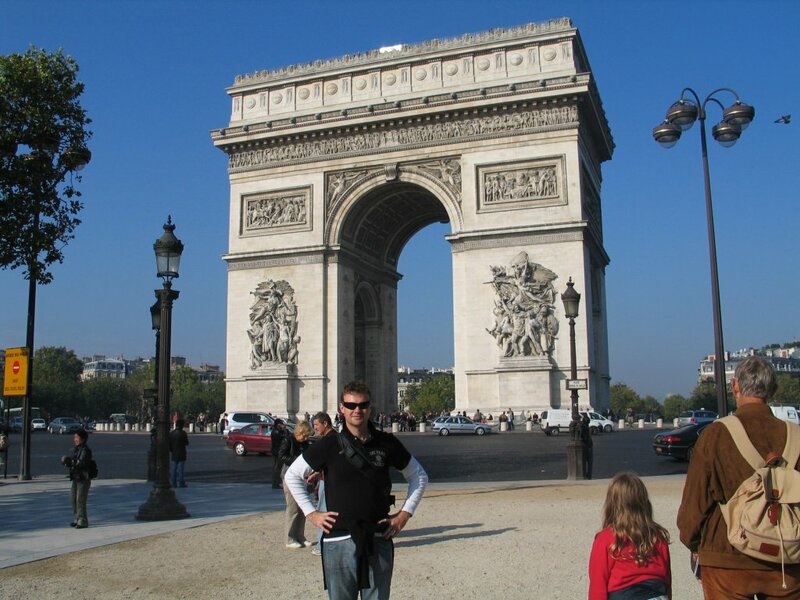 Me in front of the Arch of Triumph. The Arch is in the middle of a huge round-a-bout that has no line markings and some 12 major roads branch from it. We took the walk way under the road to the Arch and its museum. You would be nuts to try to cross this road! One other thing, watch out for people trying to steal and eat food out of your hands! Professional Beggers everywhere! 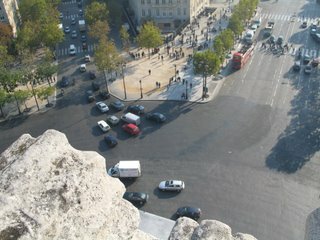 A picture from the top of the Arch of the street below. You can see there is no line markings, and people just seem to go and do what they want. There seems to be a general rule of give way to the right. This seems to be pretty normal across Europe. I guess it works, to some extent, we didn’t see any crashes. There were a few close calls though. I took some videos as well. When I get time I will youtube them. One of the main streets that branches from the Arch Round-A-Bout. The traffic was pretty heavy. 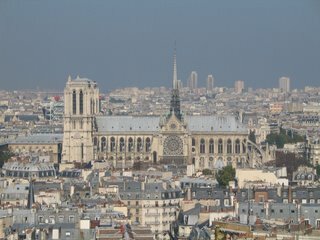 After our trip to the Arch of Triumph we then set off to meet Scott and Anne at the Cathedral of Notre Dame de Paris. 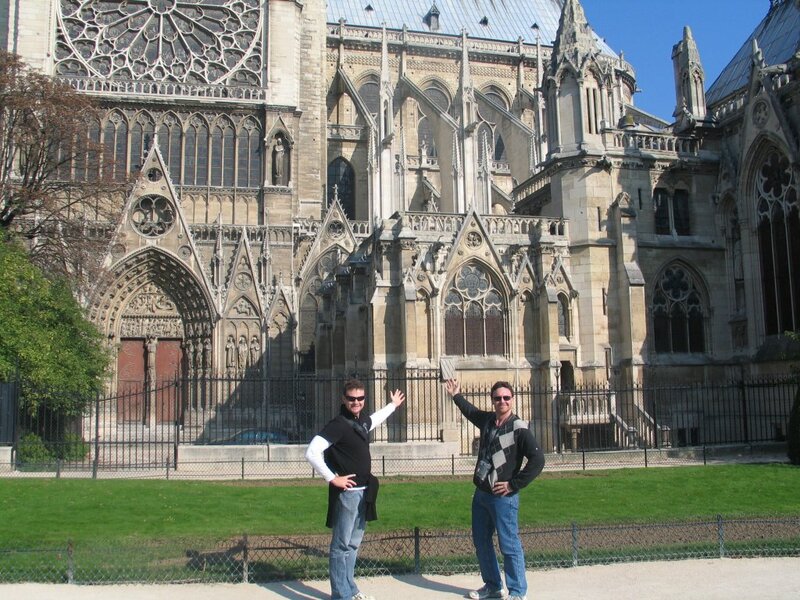 This building is one of the most famous buildings in the world and I was really looking forward to seeing it. When we got there I wasn’t disappointed. The atmosphere around the building was just great. People everywhere, sitting outside, taking photos and just enjoying the day. This is one thing I really love about Europe. When the weather is fine, people get out and saviour the day. In Australia (well Brisbane mainly) we are spoiled with brilliant weather a lot of time, making sunnies days just like every other one. 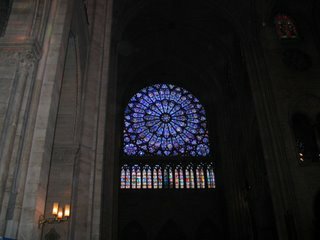 One of the huge windows in the Cathedral. Unreal. Something like 10m wide! 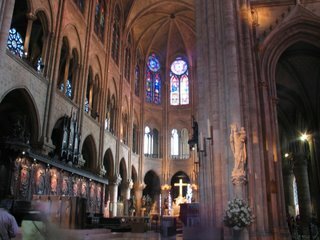 The view of the altar. On the way to the Park at the back of the Cathedral Scott and myself stopped to show off the building. Don’t we do a great job of modelling! 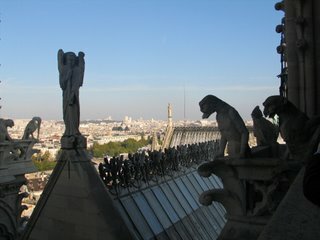 We decided that we wouldn’t climb to the top of Notre Dame at that stage because the line was too long. If we got time we would come back to it. 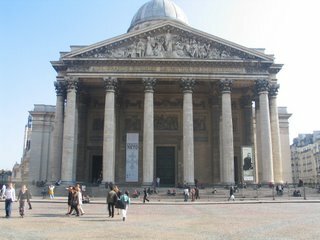 Next it was off to the The Panthéon. This was also covered in the Paris pass. The Panthéon from the front. 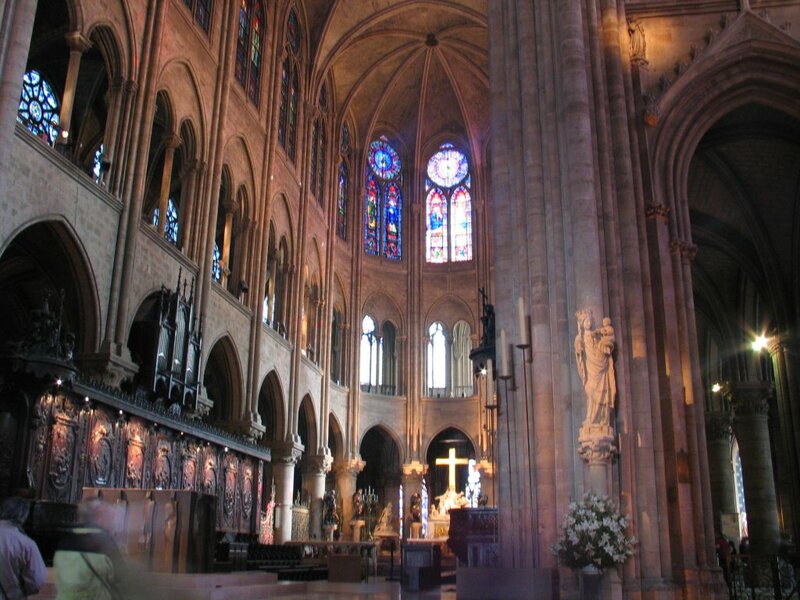 This is a massive building, and this picture really doesn’t cover the grandeur of the place. We did climb to the top of the The Panthéon. 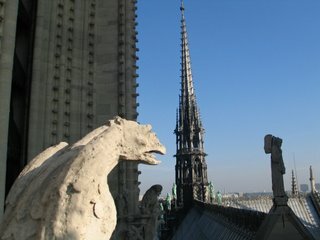 This is the view of Notre Dame from the top. After our trip up the The Panthéon, Scott and Anne went to visit a friend who was leaving Paris that afternoon. 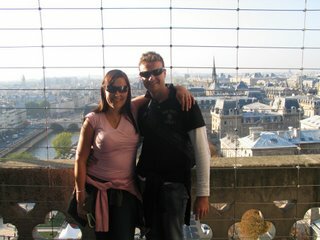 Britty and myself, loving exercise, and loving stairs decided we would go back to Notre Dame and climb the tower. 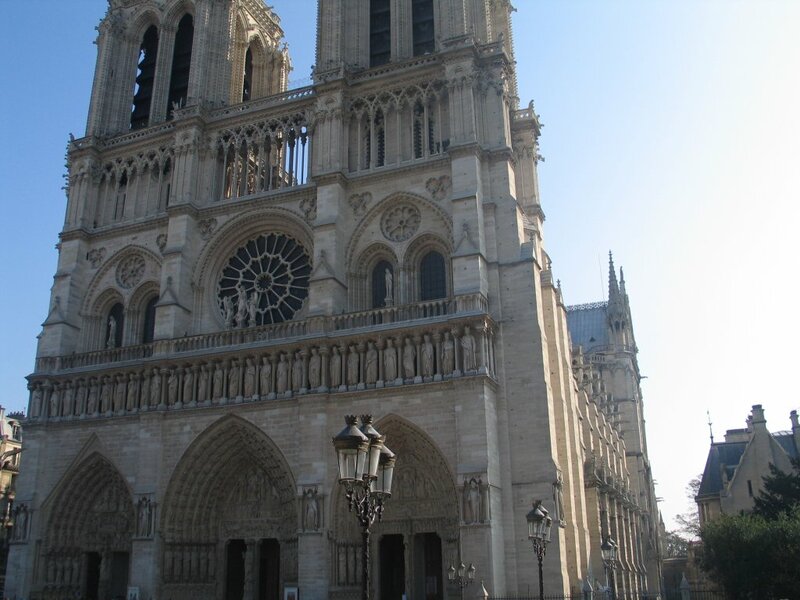 This part of Notre Dame was covered in the Paris Pass. When we got back there, the line was not so long so we went up. We made it just in time before they closed for the day. A nice asian guy took a photo for us. Looks pretty good. Thanks mate! Then we headed back to the Hostel for a while and rested. The day had already invovled climbing 3 huge structures so we needed to put our feat up. 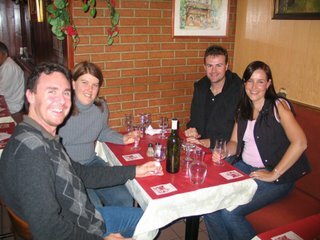 After our little rest we decided to meet up with Scott and Anne for dinner at Montmartre. 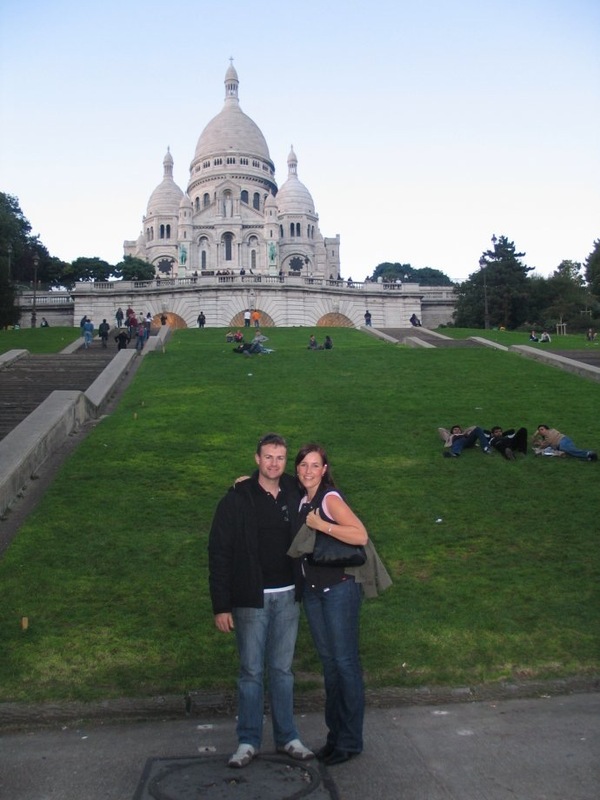 We decided to meet at Sacré-Cœur Basilica. We couldn’t miss the oppurtunity for a photo during the day. After dinner we decided to take a walk and check out the Moulin Rouge. We didn’t go in of course! 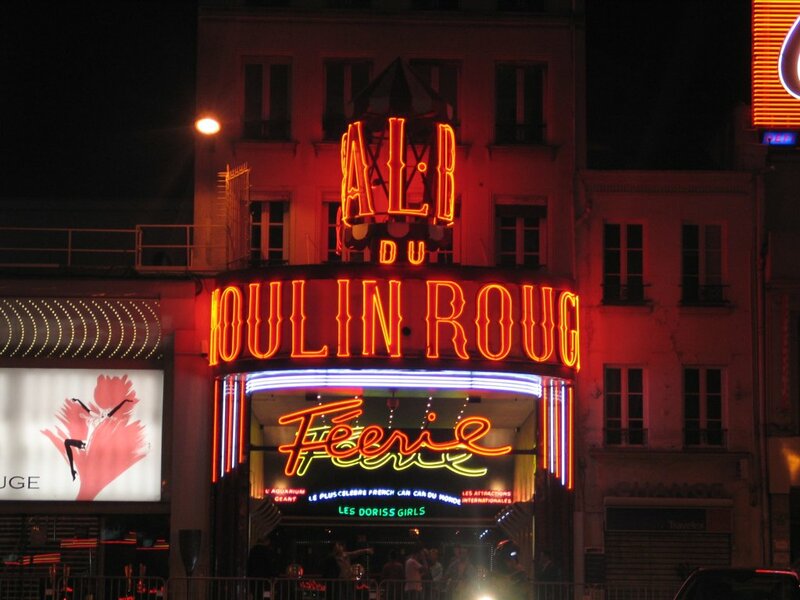 This was a very interesting area in Paris. Scott and Anne were lucky to survive the Metro station on the way home as some guy was carrying around a police baton, and waving it around all over the place. Paris is very beautiful, but there are a lot of dodgy people around!! What?? 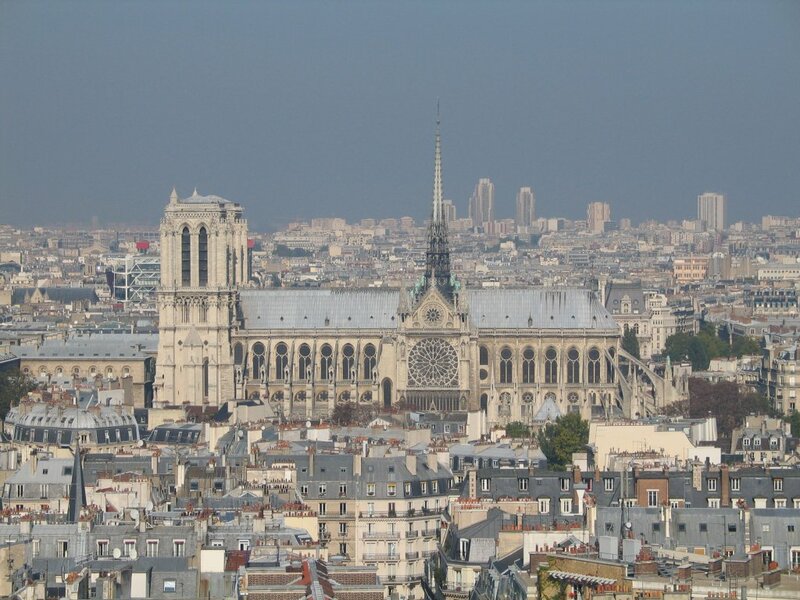 No photo of the centre of Paris, the line from which all distances to Paris are measured? 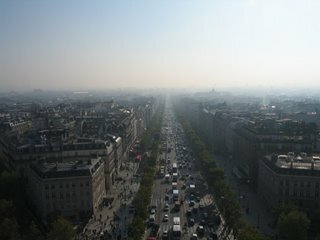 That’s about the only thing I remember from Paris, apart from being a cool view from the top of the Eiffel Tower. 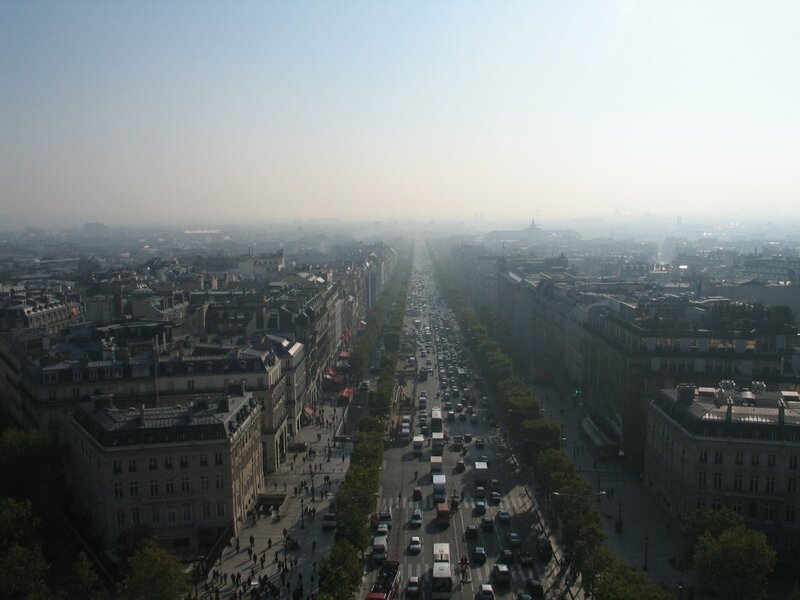 It felt special to be standing at the centrepoint of Paris when I did it. Of course, that was almost 16 years ago, so it’s probably changed since then.